The good folks at DJBooth.net and SupaHot Beats are about to light it up in the ATL. The 2012 A3C Hip Hop Festival goes down this week as some of the best in the game gather in Atlanta for a weekend of performances, competitions, panels, and much more. 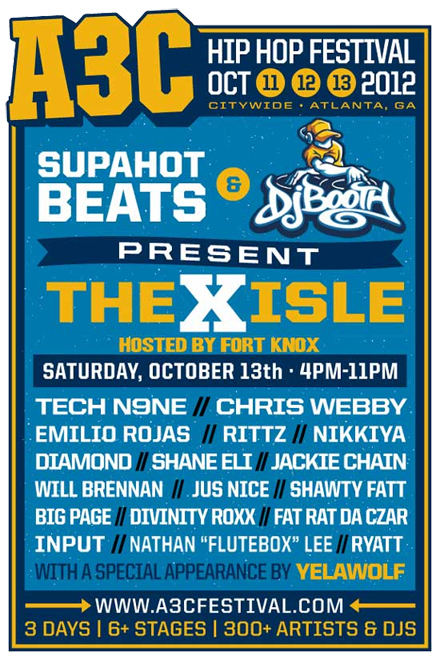 This year, DJBooth.net and SupaHot Beats join forces to give fans The X Isle showcase, which will include performances from Tech N9ne, Rittz, Chris Webby, Nikkiya, Shane Eli, Jackie Chain, and many more. In anticipation of the big night, DJBooth.net has put the spotlight on Rittz in a special “Road To A3C” feature that gives readers a brief rundown on the newest addition to Strange Music. Head on over to DJBooth.net and get caught up on Rittz before he takes the stage in Atlanta! CLICK HERE FOR TICKETS AND INFO ON A3C. Will you be in Atlanta for A3C?